I think this is a little split Peter-Pan collar. I am not sure though because the center wheel design would be on the shoulder. Just got me thinking, that’s all. It is really delicate and nicely stitched. I think I may use it on a little girl’s smocked dress one day. It may have been part of a maid’s uniform. Don’t know why I think that. It is just something that comes to mind when I think about what type of dress it could have been sewn to in the past. Anyway the design is pretty. I really like the edging with the ladder effect and scalloped scallops. This entry was posted on Thursday, March 12th, 2009 at 3:00 am and is filed under Embroidery, Lace and Sewing. Tagged: Clothing, Embroidery, Lace, Sewing. You can feed this entry. You can leave a response, or trackback from your own site. 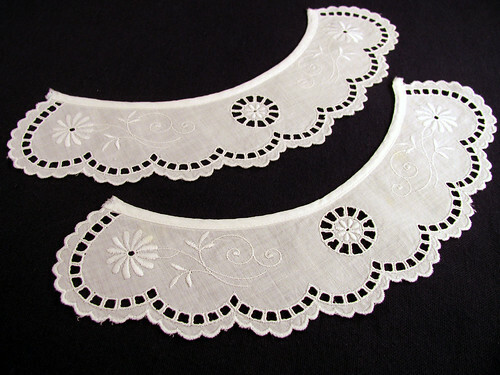 I don’t know anything about antique lace…why do you think it might be from a maids uniform?